It is time for a Community appreciation give away here on DDCPShares. There will be two winners of a Facebook game card, one from North America and one from Canada. (Canada and US only). We can ONLY buy cards in the countries we live in and they only work in our countries! 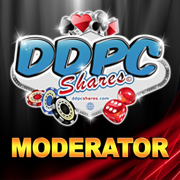 ENTER ON DDPCSHARES FACEBOOK PAGE NOT HERE IN THE RULES POST!!! Like, Share and Invite your friends to play! Winners will be a random selection. Ok, I am really an idiot when it comes to finding *things* So, where do you enter the contest? Thanks! You enter on the DDPCshares page. This is not where you enter. You enter on DDPCshares page. This is not an entry - you enter on DDPCshares page. I am from the United States and I have been playing Doubledown Casino almost every single day for 9 years. This is not an entry. Entries go on the DDPCShares page where we posted the contest. These are just the rules. I have been playing double down casino for approximately 5 years. It is my favorite game. I love the free codes. USA. I've been playing for 8 years. I am a member of DDPCshares. This is not a valid entry. Entries on on the DDPCshares facebook post. This is not a valid entry. Entries on on the DDPCshares facebook page. Not a valid entry. Entries are on DDPCshares facebook page.